Mondays, Wednesdays, and Fridays, July 8th till August 12th, 10 Am to 1 PM. Shop open 9 Am to 2 PM. A $50 is required to confirm your reservation. It is highly recommended that you take the Woodworking Fundamentals 1 class, prior to enrolling in this class. The skills acquired in the Woodworking Fundamentals -Part 1 class will be honed and refined as your sawing, chopping, paring, and planing techniques continue to improve. In this class, you will learn to build a shaker side table using a combination of hand and power tools. This project covers the basic elements of furniture making. Legs will be cut with attention to grain orientation, and joined with the aprons by mortise and tenon. Drawers are made with thru and half-blind dovetails. The knob is made on the lathe. From rough lumber to hand plane finish, each student will experience the joy of making a classic design come to life one step at a time. The Shaker Table is an excellent first furniture project. The design of this piece is simple but offers an abundance of fundamental woodworking skills that you will use over and over again. Building this table forces the student to work to a certain standard because mistakes cannot be hidden. Upholding this standard will ensure success in future furniture making projects. 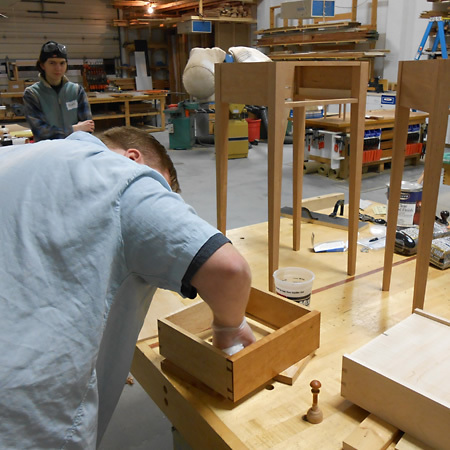 The second of the Fundamentals classes, wherein each student sets out to build a shaker-style end table.